Internet adoption: As of 2018, half the world's population (~3.6 billion people) is using the Internet, thanks, according to TechCrunch, to the availability of cheaper Android phones and increased access to WiFi. 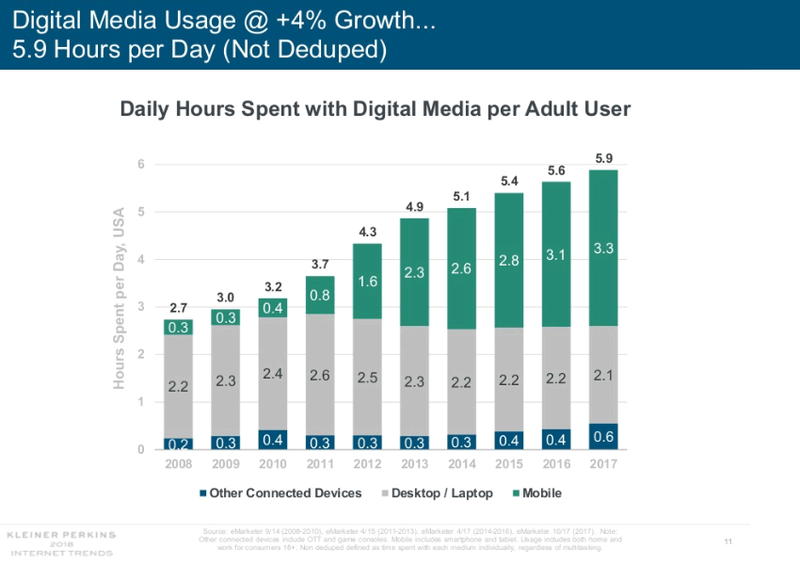 Mobile usage: TechCrunch notes that U.S. adults are spending more time online thanks to mobile. In 2017, they clocked 5.9 hours per day online in 2017 versus 5.6 hours/day in 2016. Voice: According to TechCrunch, voice technology has reached a key turning point, with speech recognition hitting 95% accuracy. Mobile video usage has been sharply increasing each year since 2012. Due to increased global access to the Internet and social media penetration, technology disruption, cheaper connectivity, and data sharing are increasing. Time spent on digital media increased from 3 hours/day in 2009 to almost 6 hours/day in 2017. Employees are seeking retraining and education from online video platforms and online courses to keep up with new job requirements. Thirty percent of today's online learners are from North America, as compared to 28% from Asia and 20% from Europe. Job search videos (e.g., resume-writing guides) online increased 40% between 2016 and 2017. Online users are discovering products via social media sites: Facebook (78%), Instagram (59%), Pinterest (59%), and Twitter (34%). Referrals from social media to ecommerce sites increased by 4% in the last year. Facebook users are engaging more with ads on the site. Content delivery platforms are re-evaluating user-generated content to ensure greater accuracy and accountability. In the last 12 months 47% adjusted mobile privacy settings; 28% disabled cookies; etc. Michael D. Shankle, MPH, Senior Director of Capacity Building at HealthHIV, noted: "It's an exciting time in technology advancement—especially related to health care—on both the individual and practice fronts. HealthHIV is applying and integrating this innovation in our capacity-building programs. Telemedicine (clinician to patient), real-time data-sharing, social-network engagement, and geo-mapping and positioning of services are just a few of the areas which enhance access to data to make informed decisions and positively impact delivery systems and health outcome." To talk with an HIV.gov digital expert about how digital and social media trends could affect your HIV communications work, make a Virtual Office Hours appointment today!